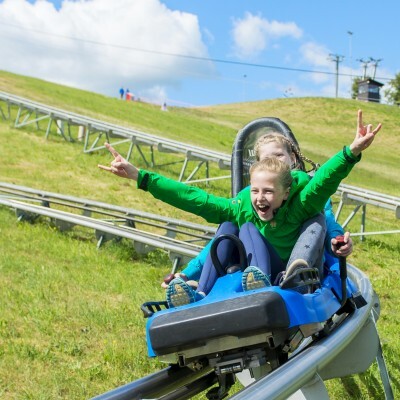 The Alpine coaster is the only such entertainment in Lithuania which seduces you to slide down the hill and feel new, thrilling emotions. 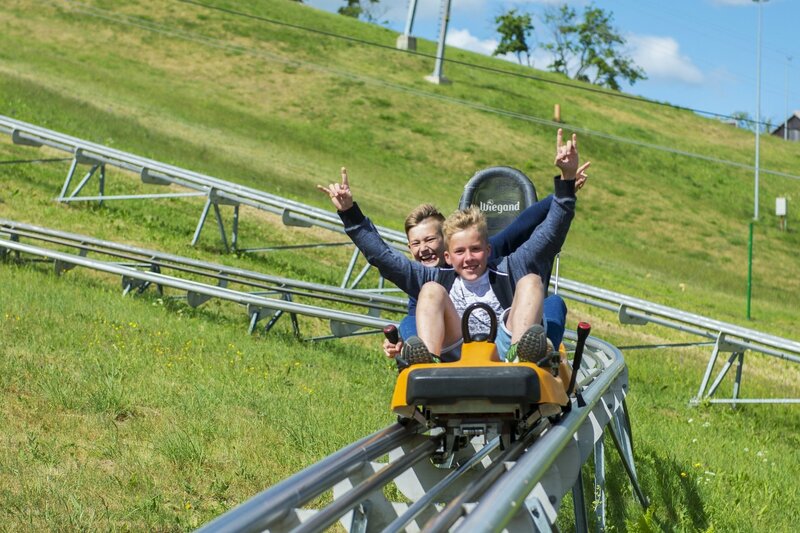 The Alpine coaster is open all year round, both: in summer and in winter. The track is 500 meters long with 5 turns, a springboard and a loop. Fasten your seat belts and catch the wind from Kalita’s Hill! Choose a safe descent rate that is not dangerous for you and those around you. The minimum distance between the sleds should be 25 m. It is strictly forbidden to approach the sled ahead. With a wet or icy road, due to a longer stopping distance, the minimum distance between the sleds should be 50 m.
Wear comfortable clothes. It is possible to slide down only with seatbelts fastened, they must be fastened during the entire period of descent and ascent. You can only stop in exceptional cases. Moving on a sled, concentrate your attention in advance, do not bend down, do not lie down and do not kneel. Follow the signs on the track and follow their requirements. At the end of the slide move to the braking device at the speed of a pedestrian. Sledge is driven by a tall man. Sitting in the back seat, he must hold the brake lever with both hands. The person sitting in front must hold tight to the handle all the way and not interfere with the person controlling the sled. It is strictly forbidden to touch the track structures with your hands or feet! Children under three years old are not allowed to ride on a sled. Children aged 3 to 8 years can use the attraction only when accompanied by an adult who is responsible for them. Persons with physical or mental disability, who can interfere with the safe management of the sled, are not allowed to use the attraction on their own. Persons who are intoxicated or under the influence of psychotropic substances are not allowed to use the attraction. Visitors of the attraction are required to fulfill all the instructions of the staff. Persons who do not comply with safety requirements and staff instructions are prohibited to use the attraction. When buying a ticket, you agree to abide by these rules. Failure to follow these rules can lead to serious health consequences. By purchasing a ticket you agree to abide by these rules. Claims related to the consequences of non-compliance with these rules will not be accepted or dealt with.